Creating the picture perfect nursery is all in the details. Whether your nursery is chic or whimsical, bright or pastel a personalized sheet with a custom design is sure to brighten up any nursery. We have all the tools at your disposal to create a head to toe crib that will fit your personal design aesthetic. Made of 100% polyester smooth minky like fabric this fitted sheet is incredibly soft. Your custom crib sheet is durable, lasting many machine washes. The fitted sheet is custom printed, cut, and sewn to order in the USA using eco friendly, non-toxic and irritant free materials. 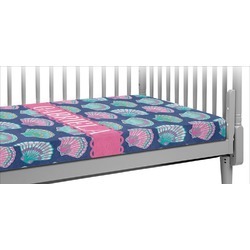 An elastic band around the edge ensures a snug fit on all standard crib mattresses measuring 28" x 52". To Prevent possible strangulation or entanglement. Never use crib sheet unless it fits securely on crib mattress. Designing couldn't be easier in our design center. Choose your background, graphic, text, and more! With this product in particular you are even able to design it vertically OR horizontally, depending on what you prefer. If you have any kind of trouble, just give us a call! We are always happy to help.